Ah now I know that true R/B is on it's way back. 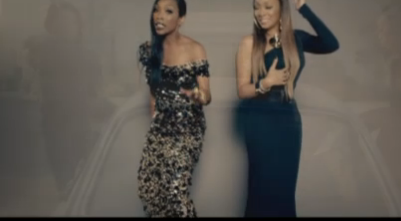 Brandy and Monica hook up after 14yrs..since their #1 single The Boy Is Mine dropped, to give us the visual for their brand new single, It All Belongs To Me. The song was written and produced by Rico Love, has the two women doing their best Thelma and Louise impression. The soulful joint is slated to be on both ladies new albums, Monica's New Life which drops 4/10, and Brandy's "2 11" which is slated to drop in June. It's rumored that their will be two different versions of the track for each one's album. The video was directed by Chris Robinson, who also directed Monica's Love All Over Me video. Check it out.